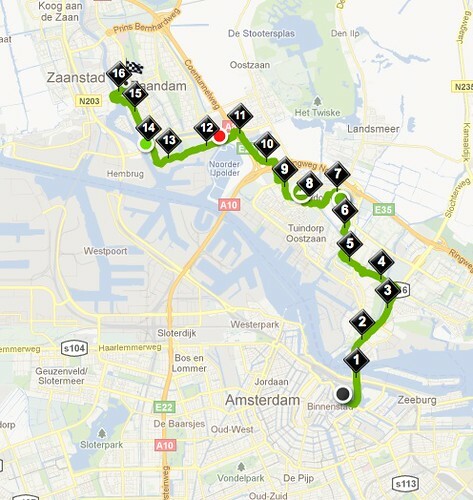 One week ago DB and I ran the Dam to Dam race, which is 16km (10 miles) from AmsterDAM to ZaanDAM, thus DAM to DAM. This was my second time. The first time was 3 years ago and since then I’ve had a knee operation and fits and starts at getting back into running shape. I was SUPER happy with my results. OK, I am at the end of the pack. I am in the 20% at the back. I don’t care. I made it, without injury and feeling pretty good at the end. My time was 1 hour and 45 minutes, which was 15 minutes faster than the first time I ran it. Yea! Now, based on this success, DB and I have this crazy and possibly dangerous idea of running the Amsterdam Half Marathon, which takes place 4 weeks after the Dam to Dam. Yes, 3 weeks from today. We must be mad. We signed up yesterday for it. This morning we both went running in the dunes and agreed we’d run 1 hour as that was just far enough to test the old legs. Wow. It’s amazing how tired and sore you can still be after running 16km a week earlier. Now that I’m sitting on the couch at 9pm, I almost feel like I had run the Dam to Dam all over again. Next weekend we plan to run between 1.5 and 2 hours to get our legs used to such a long time running. Actually, I’ll be happy to just FINISH the half marathon. I don’t mind at all if I have to walk a bit here and there to get through it. Finishing is the goal for these old legs. Well done and good luck for the half marathon..I salute you..the only thing I can run is a bath! !